اینگیلیسجه: "National Anthem of El Salvador"
The آمریکا دولاری is the currency in use. Financial information can be expressed in U.S. dollars and in Salvadoran colón, but the colón is out of circulation. السالوادور اورتا آمریکا بؤلگه سینده بیر اوْلکه. 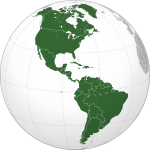 ↑ CIA The World Factbook: People and Society – El Salavador. ↑ David Scott FitzGerald (22 April 2014). Culling the Masses. Harvard University Press. p. 363. ISBN 978-0-674-36967-2. ↑ Gini index. World Bank. یوْخلانیلیب21 November 2015.